In 1926, the Milky Way bar was introduced nationally in two flavors, chocolate and vanilla, each for a nickel. 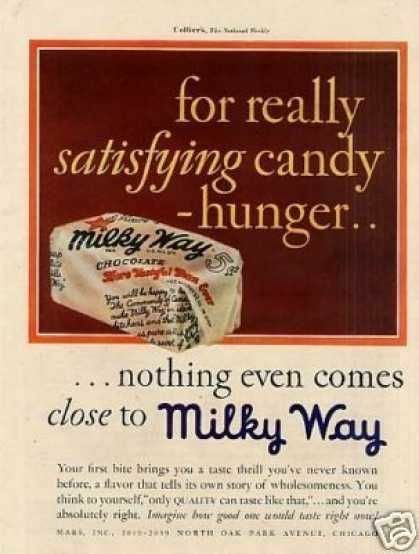 In 1932, the Milky Way bar was sold as a two piece bar – one vanilla, one chocolate, but just four years later, in 1936, the chocolate and vanilla flavors forever parted. The vanilla Milky Way bar, which was covered in dark chocolate rather than milk chocolate, was renamed the Forever Yours bar. The Forever Yours bar was discontinued in 1979, but due to popular demand, the bar returned in 1989 renamed as the Milky Way Dark bar. In 2000, it was renamed the Milky Way Midnight bar.